I was walking through the Expo Hall at PAX East when I saw it. A small package, but alluring, with its milky-white…exterior. Sometimes you sit down to write a board game review and can’t think of a snappy introduction no matter how hard you try. I try to be funny sometimes, though I know I’ll never be known as the funny reviewer. But sometimes you fail at it and have to resort to some lowest-common denominator joke, and then you can’t do that, so you resort to the even more lazy meta-commenting on your own failure. Before you know it, you’re resorted to the meta-meta infinite recursive loop of bad jokes! This one’s going to be short and sweet. The Shipwreck Arcana is a fun game with some of the best art I’ve seen in any game in quite a while. Want more than that? Fine. You’re so demanding. Open up The Shipwreck Arcana’s box and you’ll see the delight of all gamers everywhere–a mystery bag. In this mystery bag are 21 tokens–3 copies each of numbers 1-7. When it’s your turn you’ll grab two of them at random, play one, and everyone else has to figure out which one you left behind. The secret sauce that unlocks all of the deductive goodness in The Shipwreck Arcana are the cards. There are five cards displayed at any one time–four at random and one that functions as both a score tracker and a spot to place a token if you cannot place anywhere else. Each card lists a particular criteria. 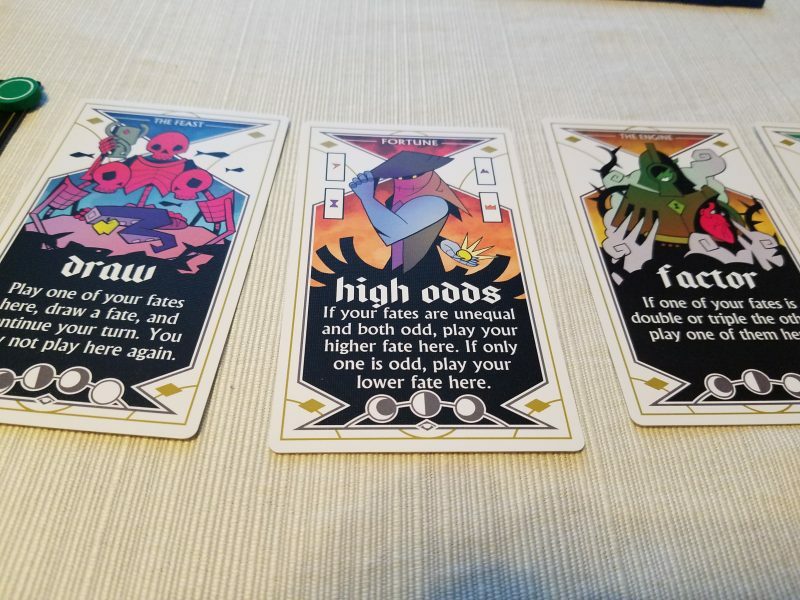 One might say “If one of your fates [tokens] is a 1, 2 or 3, and the other isn’t, play it here”, or “if the sum of your fates is greater or equal to 11, play one here”, or “if one of your fates is double or triple of the other, play one of them here”. Now I imagine you’re starting to understand some of the clever gears turning underneath this simple co-op game. The key to The Shipwreck Arcana isn’t the simple, first-level deductions. If someone plays a 2 on the first example I gave, you know that their other token has to be a 4, 5, 6, or 7. That’s easy and trivial. But that’s only the starting point. Next you’ll have to look at what they didn’t play and gather information from that. For example, if they had a 4, couldn’t they have played that on the “double or triple” card to tell you directly that their other token was a 2? Or if it was a 6, they could have played there to signal that their other token was a 2 or 3. But they didn’t play there, so can you assume it’s either a 5 or 7? Or perhaps they simply didn’t see that possibility. Similar to other clue-giving cooperative games like Codenames or Mysterium, your job isn’t just to determine what the clue might mean, but what it could have meant with something different, or with a different clue-giver. You’re reading your teammate as much as you’re reading the pure information. Of course, the math and logic on display here is much more concrete than in those two examples; words and art are much more nebulous and subjective. And frankly, with enough attention you’re going to squeeze out as much information possible the large majority of the time on any given turn in The Shipwreck Arcana. At that point you know exactly where your odds lay. That’s a tricky situation in any game, because reducing your decision making to what is essentially a coin flip or die roll is frequently not fun at all. It can feel hopeless, like your decisions amounted to nothing. But that doesn’t mean that it’s always an antithesis to fun. I’m reminded of a discussion I saw on either BGG or r/boardgames a while back where someone had posted a picture of two participants in what was (if I remember correctly) a tense game of X-Wing. They were both standing up at the table with large smiles on their faces, and the person who posted the image commented that the entire match had come down to a single die roll. The top comment noted that they would have hated that situation, because ultimately the win is in the hands of random fate. A reasonable position, perhaps, but the people were clearly enjoying themselves. Isn’t it sort of poetic that a hard-fought battle filled will all kinds of difficult decisions end with a simple roll of the die? Or is that emblematic of bad design? I don’t think there’s an easy answer here. A lot boils down to preference and how much the experience of playing the game delights you. I think it’s also worth pointing out that in any game in which there’s a decent amount of randomness, we’re prone to emphasize the random moments that have a great immediate consequence at the expense of random moments whose effects are more subtle. Sure, the die roll at the end of the game, at that point, is all that matters. But there could have been a number of dice rolls that, if they had played out differently, would have created a game state in the ultimate die roll didn’t happen at all. All of that to say that if you loathe high-leverage situations in which you know the exact odds you might want to be careful before you spend money on The Shipwreck Arcana. However, even though I’m in the minority because I think Pandemic suffers quite a bit from the “known odds” problem, I didn’t have much of an issue with it here. More of an annoyance are the issues with scaling, as the game gets more difficult as you add people to it. 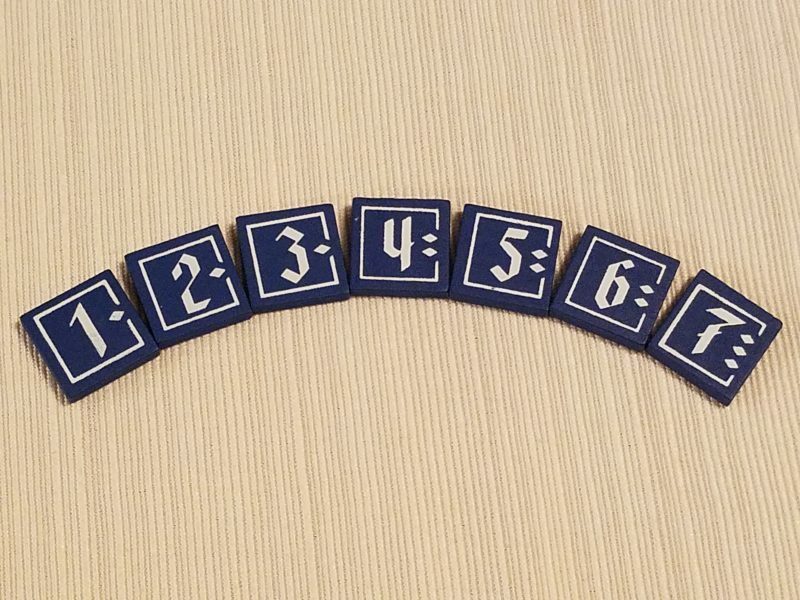 See, each of the cards have a certain number of pips on them which act as a timer, as number tiles (which also have pips) are placed in front of them, the card’s lifespan decreases. Once the number of pips on the tiles meets or exceeds the number on the card, the card “fades”. If that happens on a turn in which you didn’t guess a number correctly, you gain 2 “doom”. If you guess incorrectly, you gain one doom. The easy game lasts until 7 correct guesses or 7 doom are earned, but if you’re playing with the full complement of 5 people there are more tiles played each time around the table, which means that cards are going to be fading before you can get even a 2nd round of information from any given person. It’s easy to adjust the difficulty by simply starting with different levels of doom from the beginning, but I think I like the 3-4 player game best–that seems to be the sweet spot of difficulty and information density. The 2 player game, with the right cards, can end up being laughably easy. Of course, that’s all dependent on what cards you draw. The cards have the potential to give various amounts of information, though the ones that give more information are more difficult to qualify for. Depending on the blend of cards people might be able to make a string of plays where the right guess is deductively proven, which is kind of a bummer. After each card fades it unlocks a one-time special ability that can prove absolutely life-saving in a pinch. It’s a nifty catch up mechanism, though I find that, especially in a 2-3 player game, you end up accumulating them quickly even if you’re winning, creating a sensation of a snowball victory–the opposite of what you want in a cooperative game. But The Shipwreck Arcana isn’t about being a consistently challenging co-op experience. It’s not about game balance or complicated mechanisms. It’s a simple logic game that, every turn, gives every player a clever little puzzle to solve. Maybe the difficulty shifts too much based on the card draw. Maybe sometimes it comes down to blind guesswork. But the fact is that it’s about the journey, not the destination. And the journey is a pleasant one. I would have loved this game when I was in middle school. Logic puzzles have always fascinated me, and if you’re a middle school or high school teacher you should immediately get a copy of this game for your classroom. As an educational game without much complexity to help with reasoning skills it’s a great resource. I have the base game and the 10-card promo pack, which I highly recommend. The cards in that pack are more creative and more difficult. They provide some of the more interesting puzzle possibilities in the game.